Thembinkosi R. Ngcobo launched his novel written in isiZulu. It is entitled Ngingo KaMdali. Translated, this means “I belong to God,” and it concerns factions that are fighting with each other. There is one person, however, who is not overcome by all the bad things that happen. He wins his way to success. 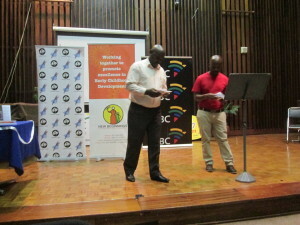 In the photograph, Thembinkosi (in the red shirt) invited his colleague Philani Nzuza to translate into English the plot of the story as he told it to the audience in isiZulu.